Trump keeps breaking the law. 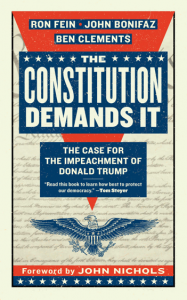 On Inauguration Day in 2017, Free Speech For People co-launched a campaign calling for an impeachment investigation of President Trump for violations of the Domestic and Foreign Emoluments Clauses of the U.S. Constitution. We have since expanded our grounds for an impeachment investigation to include obstruction of justice; a potential conspiracy to violate federal campaign finance laws in possible coordination with the Russian Government; presidential actions giving aid and comfort to white supremacists and neo-Nazis; abuse of the pardon power; recklessly threatening nuclear war against foreign nations; unlawfully directing the Justice Department and the FBI to investigate political adversaries and others for improper purposes; undermining the freedom of the press; cruelly and unconstitutionally imprisoning children and their families; and making and directing illegal payments to influence the 2016 election. Join The Impeachment Project to hold President Trump accountable! Revoke the Corporate Charter of the Trump Organization, Inc.
We’re calling on the New York Attorney General to investigate whether to begin proceedings to revoke the corporate charter of the Trump Organization in New York State. It’s time to put the Trump Organization out of business due to its collusion with the President to violate the Domestic and Foreign Emoluments Clauses of the U.S. Constitution, and its history of alleged illegal, fraudulent, and abusive conduct. We the people have the power to hold The Trump Organization, Inc. accountable for its obligations under New York state law. Join the campaign to revoke the corporate charter of The Trump Organization! In December 2016, Free Speech For People and the Campaign for Accountability filed a complaint before the Federal Election Commission demanding an immediate investigation into whether the Russian Government illegally spent money to influence the 2016 presidential election, in possible coordination with the Trump campaign. In May 2017, we filed an updated complaint before the FEC based on new evidence. Over 200,000 people across the country have signed onto the campaign in support of the FEC launching an investigation. In July 2017, Free Speech For People launched a campaign calling on the California Public Employees’ Retirement System (CalPERS) and the New York State Comptroller to divest public pension funds from the Trump SoHo Hotel in New York City, as the investment was funneling millions in retiree funds to the Trump Organization in violation of the Domestic Emoluments Clause of the Constitution. Thousands of Californians and New Yorkers joined the Divest Trump SoHo campaign signing petitions, writing letters, and submitting public comments to urge CalPERS’ Board of Directors and the New York State Comptroller to protect beneficiaries from this corruption. After months of pressure, the private equity fund that owns Trump SoHo announced it will buy out the Trump Organization’s contract to market and manage the troubled luxury condo/hotel, breaking a chain of illegal payments from state and local pension funds to the President and securing a victory for the people in the fight against the corruption of our democracy. Free Speech For People is a catalyzing leader in the country challenging big money in politics and confronting corruption at the highest levels of our government. Founded on the day of the Supreme Court’s Citizens United ruling, we are dedicated to renewing our democracy and our United States Constitution for we the people, not wealthy and corporate interests, through our cutting-edge legal advocacy, public education, and organizing work. In January 2017, Free Speech For People launched a new and groundbreaking program to challenge the unprecedented corruption of the presidency and the resulting unparalleled threat to our fundamental democratic principles. Through all of this work, Free Speech For People serves a leading force in the nation defending our Constitution and reclaiming the basic promise of democracy and American self-government: of, by, and for the people.